In the 1700’s two of the fine inns in Ipswich were run by women, a mother and daughter both named Susanna. Although the two houses are both on corners of County Street, they were separated by the river; the County Street Bridge was not built until a hundred years later. The How-Homan –Swasey Tavern at the corner of Poplar and County Streets in Ipswich. Original sections of this house may date to 1693. In 1725 Increase How purchased “a good mansion house”at the corner of County Street and Poplar Street from John Whipple, who had purchased the house from John Ayres in 1705. Ayres built the earlier structure in 1693. How kept an inn in the house, and after he died in 1754 at the age of 74 his daughter Susanna (who had married Captain Richard Homan) ran the inn. She appears to have been open-minded. In 1756 she received and took in three Catholic families from French-speaking Nova Scotia whose arrival had been anticipated and debated by the Ipswich people for several months. In the fall of 1789 just four months after he took the oath of office, President George Washington visited Ipswich and dined at Susanna Homan’s Inn. Crowds awaited him at the South Green where he was welcomed by the Selectmen and a regiment of the militia. At the Inn he partook of a meal and proceeded on to Newburyport. Susanna Homan, whose tombstone describes her as “fair and good” died three years later at age 66. Despite the early ownership records, there are no indications of First Period construction in this house. A Federal-era hip roof was replaced by a Mansard roof in the late 1800s to give it a third floor. The building is now known as Swasey’s Tavern, after the town moderator General Swasey who famously fell dead at Town Meeting in 1816. The building was later utilized as a boarding house for the pupils of the Ipswich Female Seminary. Swasey’s Tavern at the corner of Popular and County Streets, early 20th Century. On the right is the former Cogswell School, and behind it is the John Calef house. At the far end of Poplar Street you can see the Heard-Lakeman house and the Burnham-Patch house, which was also at one time an inn. The widow of Increase How was also named Susanna. In 1762, she married Captain John Smith, who had purchased the 1688 Andrew Burley house at 12 Green Street two years earlier from the estate of Andrew Burley’s widow Hannah. Andrew Burley was a wealthy merchant, justice of the Sessions Court and was elected as representative to the General Court in 1741. He updated the house with fine Georgian features. 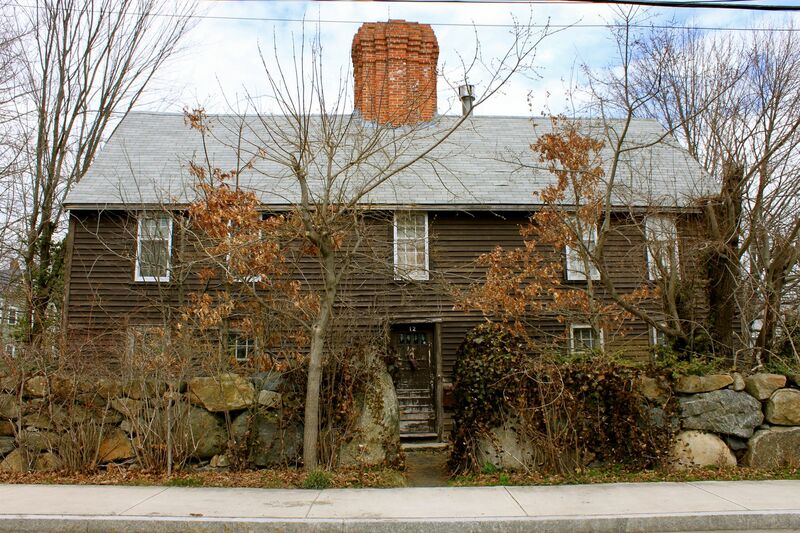 Susanna (How) Smith ran an inn in this ancient house until 1790. 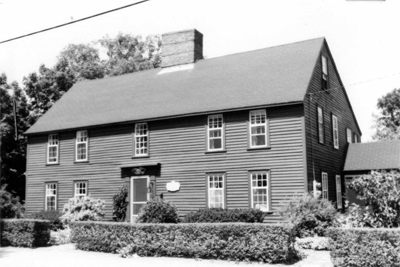 The Andrew Burley house on Green Street in 1980, photo by the Ipswich Historical Commission. The chimney in this 1980 photo was replaced by a post-medieval style columned chimney, a stone wall was erected, and trees have grown up around the house. The exterior woodwork on the Andrew Burley house has deteriorated since this photo was taken and the house appears to be dilapidated. Andrew Burley’s will left detailed instructions for the care of his widow Hannah. He left her “the improvement of the land and buildings where I now live, and to be yearly procured for her, put in her barn, by my executors one load of salt, one load of English hay, also twelve bushels of corn, four of rye, four of malt, two hundred pounds of good pork, as much beef, thirty of butter, fifty of cheese, twenty of flax from the swingle, ten of sheep’s wool, and six cords of wood, to be delivered at her said dwelling house yearly while she remains my widow, and for the same time to find her a horse and a chair to ride to meeting or elsewhere as her occasion requires. I also give her one cow and my household goods. Gordon, I’m a direct descendant of Elizabeth How who was hanged for a witch. She lived in the outer Linebrook area (where I live now). However, I was not aware of other How’s in Ipswich later on.. This is fascinating!! You are such a wonderful resource to our town. Thank you for all you do.